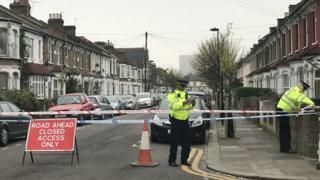 One of five victims in a series of stabbings in north London has been left paralysed, a court was told. Jason Kakaire, from Cameron Close, Edmonton, appeared at Highbury Corner Magistrates' Court in connection with the attacks in Edmonton between Saturday and Tuesday. Two men remain in hospital in stable conditions and the other two victims have been discharged. "The severity of the injuries inflicted varied, with the most seriously injured victim suffering a severed spinal cord causing paralysis", prosecutor Harika Yuksel said. Mr Kakaire was remanded in custody, and will next appear at the Old Bailey on 3 May.